The Niagara Falls PowerHawks, coming off a weekend where they nabbed 2 out of 6 possible points, they are back in action for a pair of home games against the Oswego Stampede. 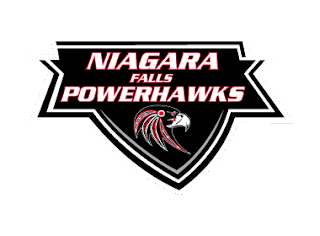 While the PowerHawks call the Hyde Park Ice Pavilion home, the games this weekend will be held at Niagara University in Dwyer Arena. The PowerHawks started off last weekend with a 6-2 victory over the Roc City Royals Friday evening. They were then swept by the Binghamton Junior Senators on Saturday and Sunday. Niagara Falls was shut out on Saturday, 7-0. On Sunday, a much closer contest, they fell 5-2 to the Junior Senators. Meanwhile, the Oswego Stampede have not been in action since the Winter Showcase in Blaine, Minnesota before Christmas. They last faced a Northeast Division foe December 8th and 10th, when they faced off against Binghamton. The Stampede currently sit in fourth place in the division, trailing third-place Skylands by 3 points, and the PowerHawks by 6 points. Game time is set for 7:30pm at Dwyer Arena for Saturday’s game. Sunday’s contest will get underway at 8:05am.